« Andrea Bocelli Yet Again in Budapest 2019. 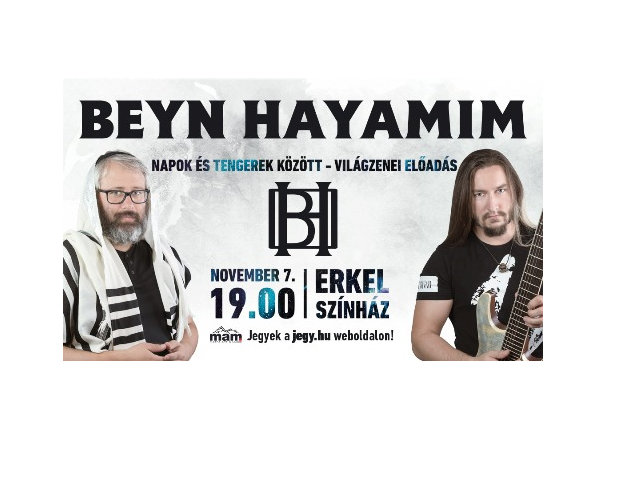 World music from Beyn Hayamim Band introducing their first album to be released on November, 7. 2018 and presenting their debut album at the Erkel Theater. During the evening special songs will be presented, the ancient, traditional, biblical scenes mixed up in the symphonic-rock and even opera. The show’s motto 4000 years in 2 hours. This is no coincidence, since the Beyn Hayamim world wants to imitate the Creator and His Tora musical diversity and complexity. It is not missionary work, but the band’s visibility goal. The ancient teachings positive, life-affirming message of the transfer and make the world a better place. A real unique show for those who are interested in the four thousand years of Judaism history, its mystical messages, if a believer, or if simply like and respect the Bible or interested in modern Israel’s history-shaping effect, such as the exotic, remote landscapes, secluded worlds melodies will be a fine time and place to spend two hours. At the concert, the songs are in Hebrew language with Hungarian translation on the projector above the stage so the audience synchronizes with the music. The band consists essentially of 13 members, but some permanent guests will join the show supplemented by 17 guests.